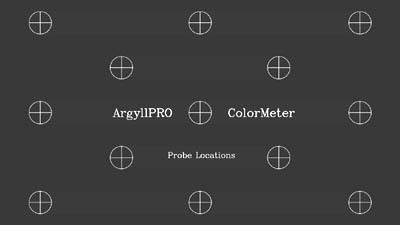 ArgyllPRO ColorMeter is an innovative handheld application designed for both Tablets and Phones, that lets you use all your USB connected color measurement instruments on the go. The popular color instruments supported can be used for a wide range of common light and color measurement tasks, so ColorMeter provides a great deal of flexibility and configurability, allowing you to customize it to the task at hand and switch tasks rapidly. It can also use a ChromCast as a compact Video Test Pattern Generator. Of interest to Designers, Graphic Artists, Photographers, Architectural and Theater Lighting Designers, Printing Professionals, Colorists, Film professionals and TV & Digital Cinema calibrators. Use your X-Rite Eye-One Display Pro to make accurate measurements of ambient, spot or display light levels and color temperature for Photography or Lighting design. Measure and calibrate Televisions and Projectors using a Klein K10-A. Check print samples using your ColorMunki spectrometer or Eye-One Pro 2 in the field. Obtain accurate sample measurements to incorporate into your documents or web pages, and find the closest matching color swatch instantly. Check movie theater certification using a JETI specbos 1211 - ArgyllPRO ColorMeter has you covered. A tool you'll want to have in your color arsenal. Why Android ? - because it's the only portable platform that gives applications ready access to a USB host port - something essential to being able to use accurate, readily available color measurement instruments. The fact that it's the largest open platform for mobile applications, and as well as being available in a wide range of form factors and price points, adds to its attraction. Not all Android devices will be able to run ColorMeter, although the situation is improving all the time with the introduction of newer Android based products. You need to be running Android version 4.0 (Ice Cream Sandwich) or latter, and your Android device needs a functional USB on the go (USB OTG) port to connect to most instruments, or Bluetooth to connect to Blutetooth capable instruments. 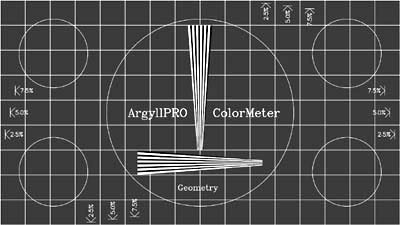 Before purchasing ArgyllPRO ColorMeter or an Android device capable of working with your instruments, it is highly recommended that you explore ColorMeter's capabilities, and check that it is going to work with your hardware, by downloading and running the free ArgyllPRO ColorMeterDEMO application. 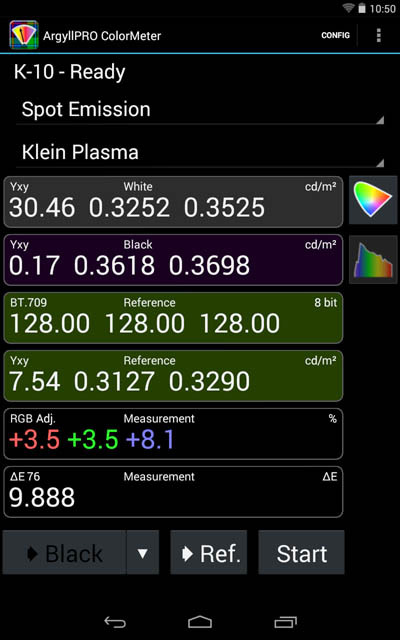 See the FAQ below for more information on choosing an Android device and/or Color measurement Instrument. Tri-stimulus & Spectral measurement in Emissive, Ambient, Reflective, Transmissive & Flash measurement modes. Current measurement, reference measurement and White, Black, Red, Yellow, Green Cyan, Blue and Magenta Primary measurement registers. CIE XYZ based tri-stimulus colorspaces: XYZ, Yxy, Yu'v', L*a*b*, L*C*h*ab, L*u*v*, L*C*h*uv & DIN99 Lab. Component differences between the Reference and the Measurement CIE XYZ based tri-stimulus colorspaces. Delta E between Reference and the Measurement: CIE Delta E 76, CIE Delta E 94,CIE Delta E 94 Textile, IE Delta E 2000, CMC Delta E 2:1, CMC Delta E 1:1, DIN99 Delta E.
Density: Visual Density, Status A Density, Status M Density, Status T Density, Status E (DIN) Density, ISO Type 1 & 2 Density. Photography specific: Incident illuminance, reflected luminance, flash measurement, Exposure Value (EV), Interactive Exposure Calculator. 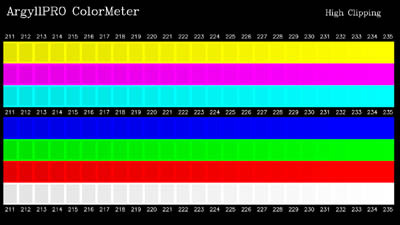 Color Temperature, Delta Color Temperature, Black Body or Daylight, Correlated or DE2000, Kelvin or Mired. Configurable RGB colorspace including BT.709, BT.2020, DCI-P3, custom, BT.1886, Delta RGB, RGB or CMY Adjustment Direction. Color Rendering Index (CIE 1995 Ra + R9), Television Lighting Consistency Index (EBU TLCI-2012 Qa), IES TM-30-15 Light Source Color Rendition. Web RGB, Visual Compare Swatches, Named Color, Named Color Visual Swatch, with installable CxF or ICC Palettes. 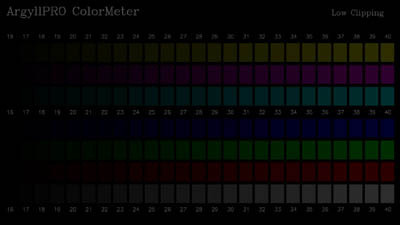 Save and Restore ColorMeter and Instrument configurations. JETI specbos: 1211 & 1201, spectraval 1511 & 1501. SwatchMate Cube, with improved color accuracy. By making use of a ChromeCast, ColorMeter can act as an HDMI Video Test Patch and Test Card source. While the ChromeCast is not a bit perfect TPG, the use of dithering makes it accurate to within perceptual limits. It can be used to display one of six standard Test Cards, covering Display geometry, Probe locations, Low clipping, High clipping, Neutrals and Color ramps. It can also be used to display a test patch color that matches the reference RGB value Readout, which combined with continuous measurement mode and Delta E and RGB adjustment Readouts, gives color by color Video calibration capability. USB On The Go (OTG) capable Android tablet or phone. Recommended screen size of 94 mm (3.7 inches) or greater. Android V4.0 (Ice Cream Sandwich) or later. Bluetooth for connecting to JETI spectraval 1511 & 1501 wirelessly, BlueTooth LE for connecting with SwatchMate Cube wirelessly. as well as the 2 Minute Overview + Guided Tour Video. 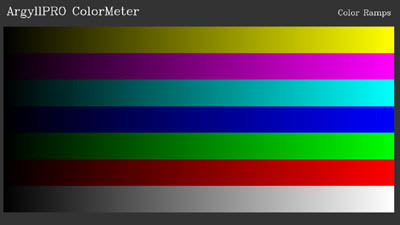 Please visit the Google Play store to install the ColorMeterDEMO (free), or ColorMeter applications. If you have trouble getting your instrument to work with ColorMeterDEMO when you expect it should work, or are having other difficulties running the software on a particular Android platform and are prepared to help a little in figuring out why, please contact support@argyllpro.com.au. Make sure that you plug the instrument into the OTG cable, and then plug the OTG cable into your Android device. Doing it in the reverse order can often mean that the instrument won't be recognized. micro-B USB 2.0 OTG to Male B for i1pro2, DTP20 etc. 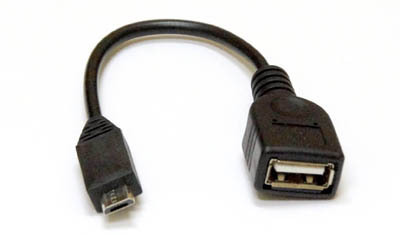 If your Android device has a USB C port, then you will need a USB C to USB 2.0 female Type A adapter. These are widely available as accessories for USB C equipped devices. Using USB C, it seems to be more reliable to plug the OTG cable into your Android device and then plug the instrument into the Adapter cable. This is the reverse of the OTG cable! If you are using the JETI spectraval 1511 or 1501 and your Android Device supports Bluetooth, or SwatchMate Cube and your Android device supports BlueToothLE, then you can use Bluetooth instead of USB. You can preview the EULA here. 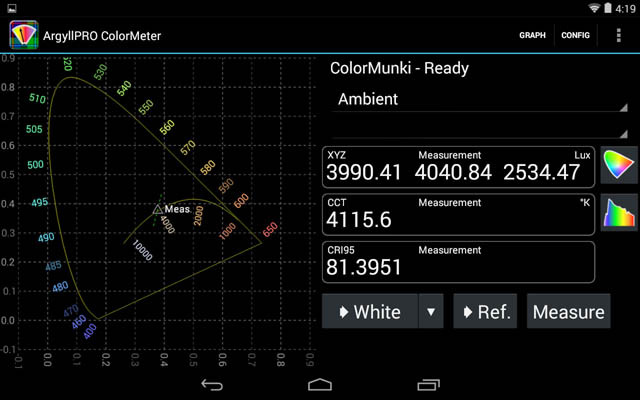 android.hardware.usb.host Required by ColorMeter, used if available by ColorMeterDemo. 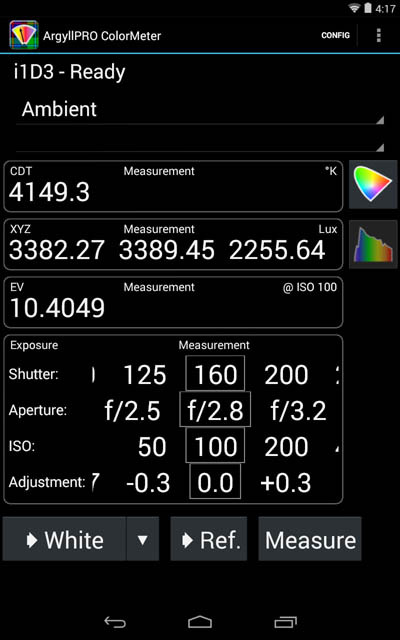 android.hardware.camera May be used in future releases for measurement logging. android.hardware.bluetooth_le To be able to access SwatchMate Cube Bluetooth LE and JETI Spectraval BT. android.permission.READ_INTERNAL_STORAGE To be able to load setup files and save configuration state. android.permission.BLUETOOTH_ADMIN To be able to access SwatchMate Cube Bluetooth LE and JETI Spectraval BT. android.permission.ACCESS_COARSE_LOCATION For locating Bluetooth LE instruments to connect to. android.permission.ACCESS_FINE_LOCATION May be used in future releases when required for measurement logging. A list of all the major updates for each release is here. Support is via the colormeterlist mailing list. To subscribe, go to the colormeterlist mail manager. Mail to colormeter@argyllpro.com.au and support@argyllpro.com.au will be responded to on an "as available" basis, and in most cases a speedier response can be expected from the mailing list. Q: Will there be an iPod/iPhone/iPad version ? A: Unfortunately this is unlikely, since (as explained above), the ColorMeter application depends on access to a USB host port on the device, and iOS devices have neither a USB port, nor are applications allowed to directly access a USB port using any readily available USB host adapter. Until Apple changes its policy in this regard, there can be no version of ColorMeter for iOS. 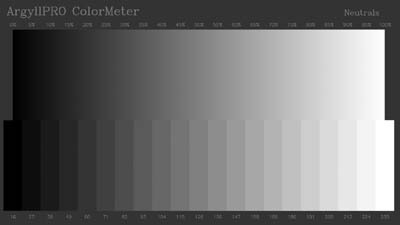 If you think you would find ColorMeter useful, then the most pragmatic solution at present is to buy an Android device that will run it. Such devices are becoming cheaper and more readily available all the time. Q: Will it run on a BlackBerry using "Runtime for Android" ? A: Unfortunately there are two limitations of Runtime for Android that prevent this from being possible. One is that it doesn't support USB OTG connectivity. 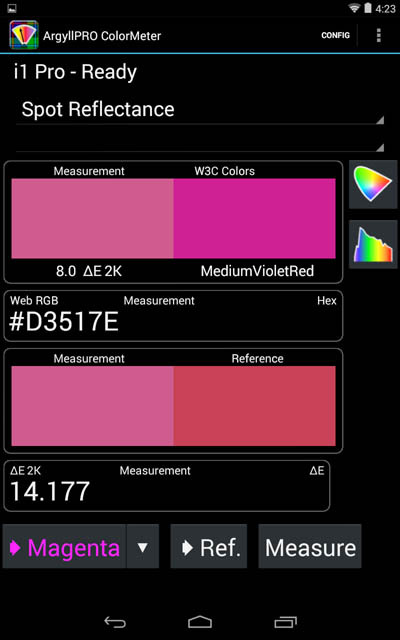 The other is that it doesn't support Android NDK libraries, and ColorMeter relies on a native library for its instrument driver code. Q: What Android Tablet would you recommend ? A: I can highly recommend the Nexus 7 (new or second hand), as it work with all USB instruments and has battery capacity to power them, as well as a very useful display size while still being small enough to comfortably hold in one hand. The Nexus 7 has become hard to get now, and one other 7" device that I have tested with all the instruments is the Lenovo TAB3 7 Essential. The positives about this tablet is that 1) it works with all the instruments and 2) it's cheap. Disadvantages are 1) it's display is lower resolution and has an incorrect aspect ratio and 2) it's battery performance when sleeping isn't great. Another tablet that works well is the Samsung Galaxy Tab A 8 (2017). 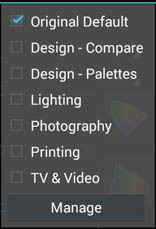 Other, tablets and phones featuring Android V4 and USB OTG support, and therefore potentially able to run ColorMeter, are also widely available. 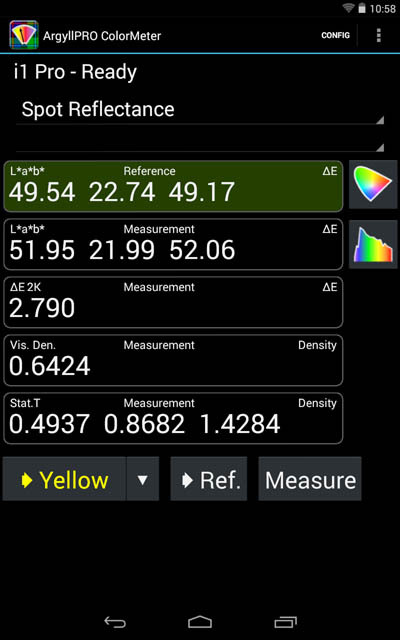 Note that a number of people have reported problems with using some Samsung models (Galaxy S3, Galaxy Tab 3, Galaxy Note 2 and others) in combination with the ColorMunki spectrometer. This may be due to a bug in Samsungs USB host hardware or driver, and so may depend on which version of Android it is running. Here is a list of the Android devices that existing customers are using, but the safest thing is to try out a tablet or phone using ColorMeter Demo, to make sure it will work with your instrument, before you buy it. Q: What instrument would you recommend ? A: This very much depends on what you want to measure, and your budget. For low cost light level and emissive, ambient and display color measurement, it's hard to go past the X-Rite i1 DisplayPro or ColorMunki Display colorimeters. For entry level display measurement, the Spyder 4 is another choice. To make reflective measurements at the absolute lowest cost (but with very limited accuracy), the SwatchMate Cube may be appropriate. For a versatile and relatively low cost spectral measurements, the X-Rite ColorMunki Design or Photo is hard to beat. This combination is great for graphic arts and photography use. A higher end general purpose spectrometer that can be used is the X-Rite Eye-One Pro2. For high speed and high accuracy display measurement, the Klein K10-A Colorimeter would be the ideal choice. For the most accurate spectral emissive, ambient and display measurements, then specbos 1211 and 1201 Tele-Spectro-Radiometer is the right instrument, or a spectraval 1511 or 1501 if ambient measurement is not needed. Q: My i1pro2 doesn't work! - I get an error during reflective calibration and/or measurement! A: One of the things many people have noticed about X-Rite's i1pro2, is that it is very sensitive to the USB lead length and quality. This is probably an issue with the power being supplied over USB to the instrument, and X-Rite having made it very particular about the voltage level. This manifests itself as a problem whenever the measurement light gets turned on, often during calibration. One solution is to try using a shorter (but high quality) USB lead, say around 1 Meter (3 feet) in length. A short lead often makes the whole arrangement more convenient to use in a hand-held configuration anyway. Another solution that may work if this problem has just started after successfully using the instrument, is to use some electrical contact cleaner spray on the USB connectors, as high resistance due to dirt and contact wear can trigger the problem. Some Android devices may not be able to supply sufficient power to the reflective measuring instruments, or may have a poor USB voltage level, making them unsuitable for use with the i1pro2. Q: When I plug an instrument or other USB OTG device in, nothing happens. How can I fix this ? A: Either your Android device doesn't support USB OTG, or it is not enabled. For instance, the Sony Z5 has a "detect usb" button in the notifications panel that should be turned on. Q: Is ColorMeter available in any languages other than English ? A: At the present time, no. CGTPL is a small company, and currently does not have the resources to provide a fully internationalized product.